The Weird Play embraces the fact that it's hard to pin down. "This seems like a difficult play to distill into a synopsis," I say to playwright Jenifer Nii over the phone, talking about her new work The Weird Play. "How do you summarize what it's about?" Silence. Silence. Then, finally: "You can tell by the long pause that I haven't really found the answer to that question." Some creative works aren't easy to simplify, but what makes them hard to market can also be what makes them fascinating. The world-premiere of The Weird Play—a co-production of Plan-B Theatre Co. and Sackerson Theatre Co.—finds Nii wrestling with issues that have troubled her over the past year-and-a-half, as well as with the things she still wanted to accomplish as a writer. "As I was thinking about my next project," she says, "I made two lists. One was about things I was insecure about, or didn't think I'd done well from a technical perspective; the other was things I didn't feel I understood, questions that might be interesting to explore in the theater. "Over the last year and a half in particular, I live in a country that is going through some pain," she adds. "As I was looking around, I thought, 'Gosh, love. I think we might be forgetting.' ... I was just seeing an excess of meanness, and a dearth of compassion. On a micro-scale, I was just trying to figure out how to be less mean—to myself, and to others." An idea as simple yet complicated as love then became the foundation for The Weird Play, which includes three characters identified only as One, Two and Three. The idea, according to Nii, was to track the idea of a romance from its initial infatuation to a later deepening of emotion. And the more universal that idea could be made, the better. As part of that attempt at universality, Nii was careful not to define the characters' demographic identities too narrowly. Only the character of One was written specifically as female, and no age or ethnicity is specified for any of them. 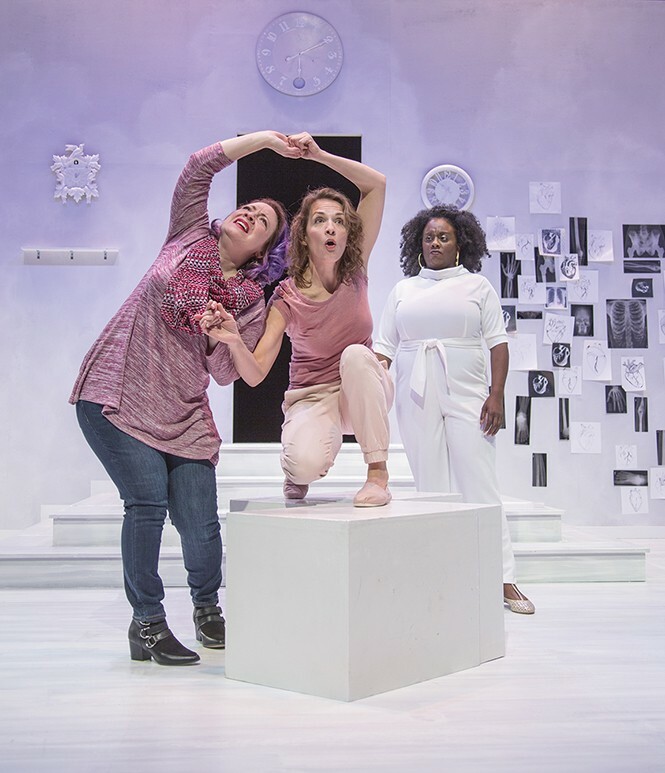 While the cast for this production is made up of two caucasian women and an African-American woman, the initial reading for Plan-B's playwriting lab found the same characters played by a woman, a caucasian man and an African-American man. "When I was trying to figure these characters out," Nii says, "it seemed strange to call them Sally and Stan and Craig. I didn't want it to be limited at all by what all names connote, or by gender, or by ethnicity." Director Alex Ungerman agrees that the ways in which The Weird Play is hard to pin down also make it appealing. "One of the biggest things that stood out to me is how highly stylized it is, and how it can be interpreted on multiple levels," he says. "A creative team could produce this 10 different ways. We made some decisions, but audience members are going to walk away, and it might be one thing to one audience member, and something completely different to another." Ungerman also notes that the "love" Nii refers to as central to the play isn't even necessarily just about romance between two humans. "On one level, this is a story about two people in love," he says, "and on another, it's about one person's relationship with God, or with an institution like a church. This script is incredibly relevant right now in a state where people have complicated relationships with religion, and shifting ideas about that relationship." Nii appreciates what Ungerman has brought to The Weird Play and recognizes that for a text this full of potential interpretations, the collaboration with all of the artists—on the stage and behind the scenes—becomes part of a unique creation. That doesn't mean she isn't also curious, should there be future productions of The Weird Play, what it might look like with a completely different cast. "It is presumptuous and horrible of me to even think beyond a premiere," Nii says with a laugh, "but ... I would love to also see what would happen if you cast a 50-year-old man as Two. Or if you happened to have an all-Asian cast. What would that do to the vibe, and how might it change people's interpretations?" For now, there is this production, and an invitation to audiences to give themselves over to a work where the title alone clues you in to its distinctiveness. "I was thinking of calling it Three, and so many other things that just felt so frou-frou and pretentions," Nii says. "I kept thinking, 'It's just this weird play. What am I going to call this thing that's just this weird play?'" It was Plan-B's artistic director Jerry Rapier that offered the solution, Nii says: "Jerry said, 'Just call it that.'" If you're going to make something that's not easy to describe in a sentence, it's best just to embrace that.